Welcome to the middle of the week everybody. I hope it is going well for you all. The PS4 was announced this afternoon and at the center of it all was Mark Cerny, who used to design arcade games for Atari. In addition to work on the hardware for the new system he is also directing a game for it so some of these guys keep their work going in video games, just in other parts of the industry. I guess one question now is would the PS4 be turned into arcade hardware like every other PlayStation console has, seeing that it’s more of a PC anyways (which most arcades use)? I guess we would have to look to Namco for that since they generally are the ones that arcadify console hardware. I kept this in a separate post but if you didn’t catch it, share your thoughts on the thought experiment of the day. Especially if you own/operate arcade equipment. EAG2013 is well past us but Arcade Belgium has an excellent write-up from the show, which you can read here. We brought this up already but just in case it was missed, Sega has surprised us by bringing one of their music games over to the US to test, their Project DIVA Arcade machine. It is on test at the Round 1 USA in the Puente Hills Mall, CA until next month sometime so go and check it out if you have a chance. I can’t find any videos of the US loctest yet but here’s the next best thing in case you are not familiar with this game. We don’t really get into MAME news but here is something that took a turn that was more interesting than just getting some hardware emulated properly. A ROM hack was made for Bubble Bobble called Bubble Bobble Lost Cave. This hack takes the best of the unique levels that were released on the home versions of the game to various consoles (NES, Game Boy & Game Boy Color, Sega Master System) and integrates them into the arcade. A user by the name of monstermug posted this video online of the game running on actual Bubble Bobble arcade hardware after burning the ROMs and plugging them into the board. As you can see, it works beautifully. 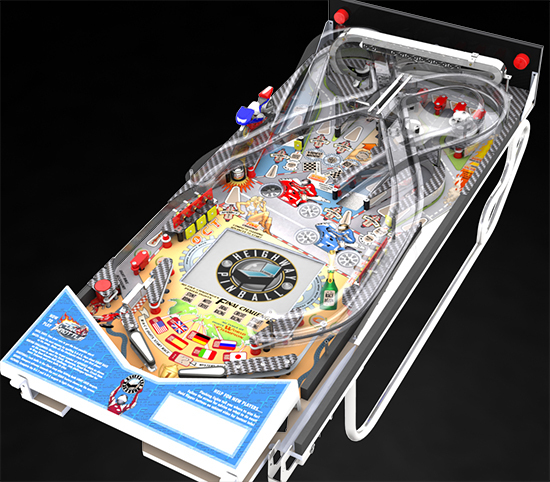 There are some new images for Heighway Pinball’s upcoming (and non-licensed!) Full Throttle Pinball game, as seen at Pinballnews.com. It’s looking great so far but hopefully we will see an operational machine available for purchase soon. This also uses an LCD but it will place that in the playfield so its easier to see while you are trying to watch where the ball is going. Lastly, as the gun debate continues in the USA, now Connecticut has a bill sponsored by Democrat Connecticut State Senator Toni Harp to “To prevent minors from using violent point-and-shoot video games in public arcades and to create a task force to study the effects of violent video games on youth behavior.” You can see the proposed bill here. If you read it you will notice that the task force study it to be turned in a year after this proposed bill takes effect (Oct. 1st, 2013, the study to be completed by 2014) but here’s an idea for the genius politician who is doing this – how about you do the study first and then take actions based upon that before coming to the final conclusion (that arcade light-gun games are turning our kids into blood-thirsty killers) and passing a law that will most certainly harm small businesses in its wake. That of course is probably lunacy to think on my part since the findings will probably not line up with what Ms. Harp wants, thus making the law pointless. Instead, better get a ban onto the books first so we can get the “We’re Doing Something” crowd excited and the donations rolling in because SomethingTM is being done, no matter how stupid or pointless that something might actually be. Seeing how the industry has not done a lot of diversification in game genres in recent years, removing light-gun games from locations leaves the video-only side with pretty much driving and music games on the new side. I get that this is just for the tiny state of Connecticut and most likely a ban there if passed will not cause game makers to stop producing gun games, but if such bans spread to other States then it is going to cause problems for the arcade industry to a greater degree. It will also affect the collectors market with game values. I don’t know the likelihood of this passing but I do imagine that if it does you will see challenges brought to it in court. For me regarding the the gun law (even though it’s different in the UK and Europe) I think that arcade gun games are the least likely games to make kids want to kill since games get an age rating particularly in the states for arcade game that are in the public and not private use. If anything it’s games like call of duty that would make kids turn violent if anything and even so I think it’s a bit far fetch and depends on how the child is brought up who is playing that game (although no child under 18 should be playing such a game like that). Why not just ban guns altogether in general and then they’ll be no problem, even if the law passes they still have a way to go, I’m just surprise no ones targeting bugs bunny with Elmore thud using his gun to shoot at him or cowboy films and besides not ALL kids turn out to be cold blooded killer from playing violent video games, it all comes down to the upbringing.